Who came up with the names of the constellations? The naming of constellations dates back to ancient civilizations. In 140 C.E. the ancient Greek astronomer Claudius Ptolemy cataloged forty-eight constellations visible from Alexandria, Egypt. All but one of those forty-eight are still included in present-day catalogs, and that one (Argo Navis, the Argonauts’ Ship) was subdivided in the 1750s into four separate constellations. Many new constellations were named in later centuries, mostly in previously uncharted parts of the sky in the Southern Hemisphere. (Some of those constellations have since been abandoned.) Many of the constellations originally had Greek names; these names were later replaced by their Latin equivalents by which they are still known today. 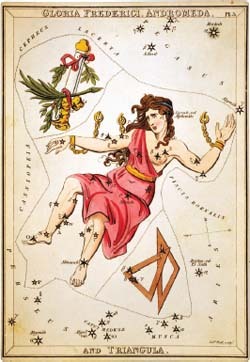 This 1825 illustration by Gloria Frederici depicts the constellation Andromeda. Many constellations are named after gods, goddesses, and creatures from the days of ancient Greece.